and squeezed my aqua painter to mix water with the color. on the water color paper. I used the gold emboss powder and my heat to emboss the image. 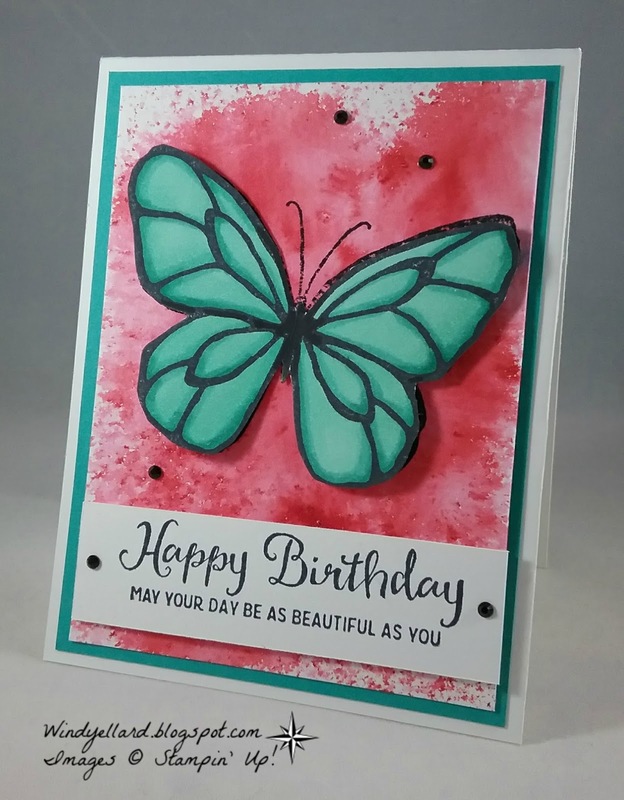 I used the color to paint inside the butterfly. A few areas I went over again to make darker. He really looks like a patch work butterfly. I layered the 3 1/8" square on some gold foil. with some gold enamel shapes. I tried to place a sentiment on but it just did not flow. I like it without so can use for any occasion. 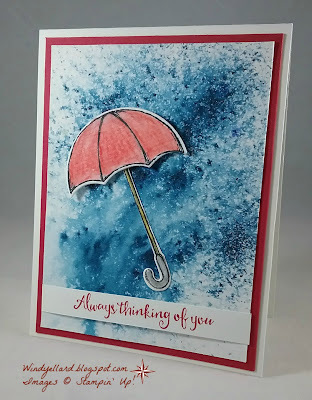 I am enjoying creating with the Brusho colors! I hope you have a safe and fab New Year's Eve. Happy Last Day of 2017! 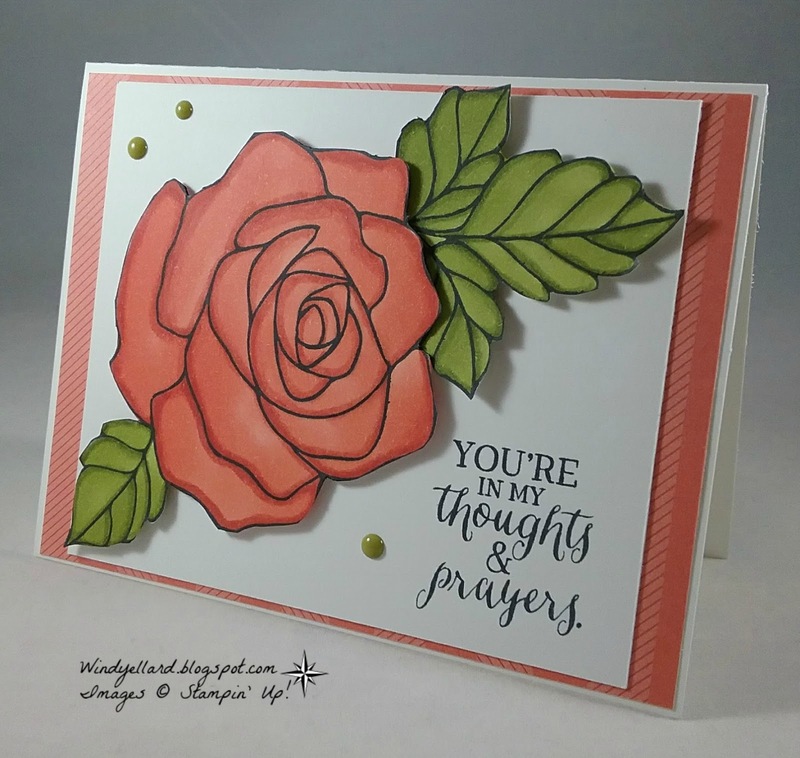 with the Stampin Blends markers in Calypso Coral and Rich Razzleberry. and then tuck it in a little to the rose. 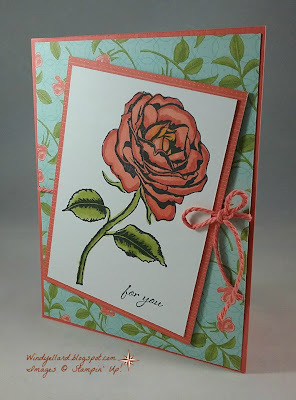 I stamped the sentiment from the same Rose Wonder stamp set. piece of Petal Garden DSP and a thick Whisper White base. 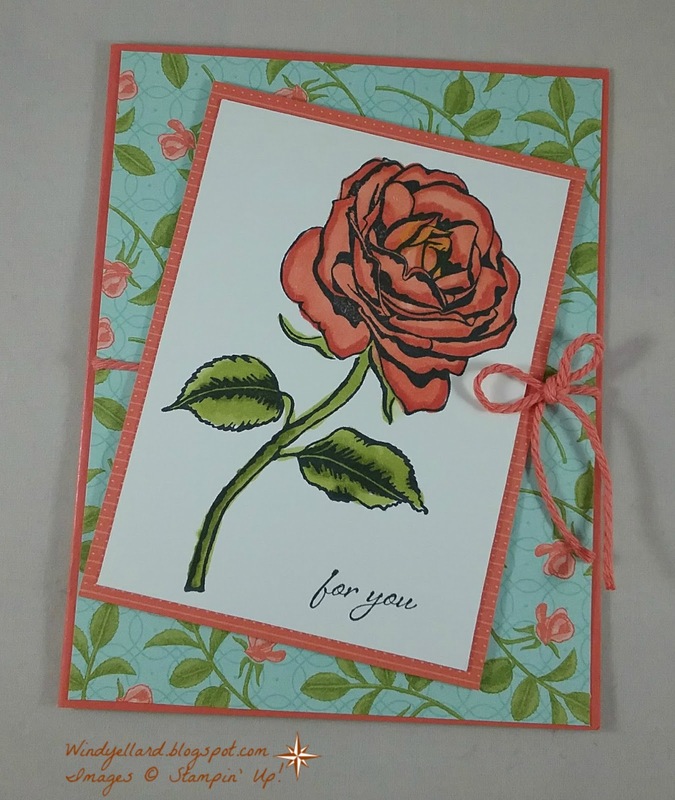 but the focus is on the rose and sentiment anyway! I hope you enjoy your last weekend of 2017! 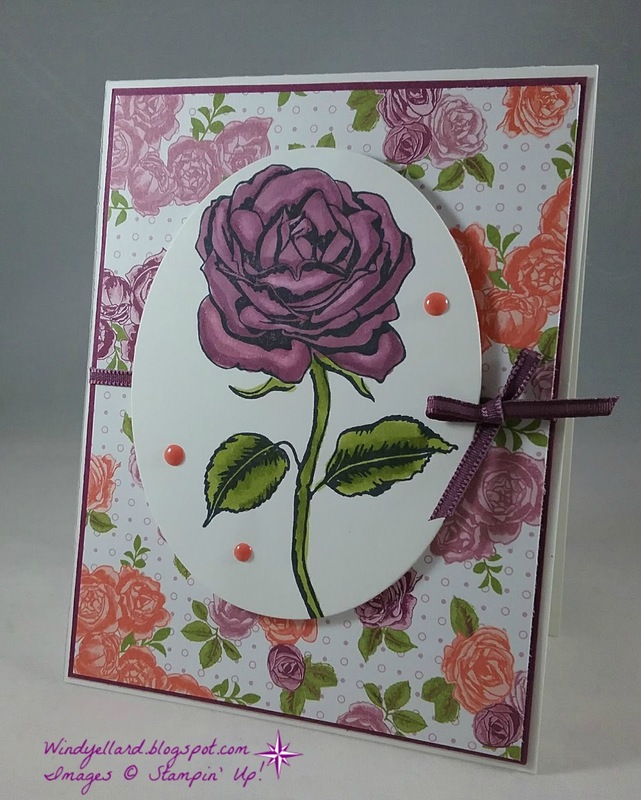 with an oval die and popped up on a piece of Petal Garden DSP. because I noticed some ink on the right by the flower. You got hide something now and again! instead of straight on the card. 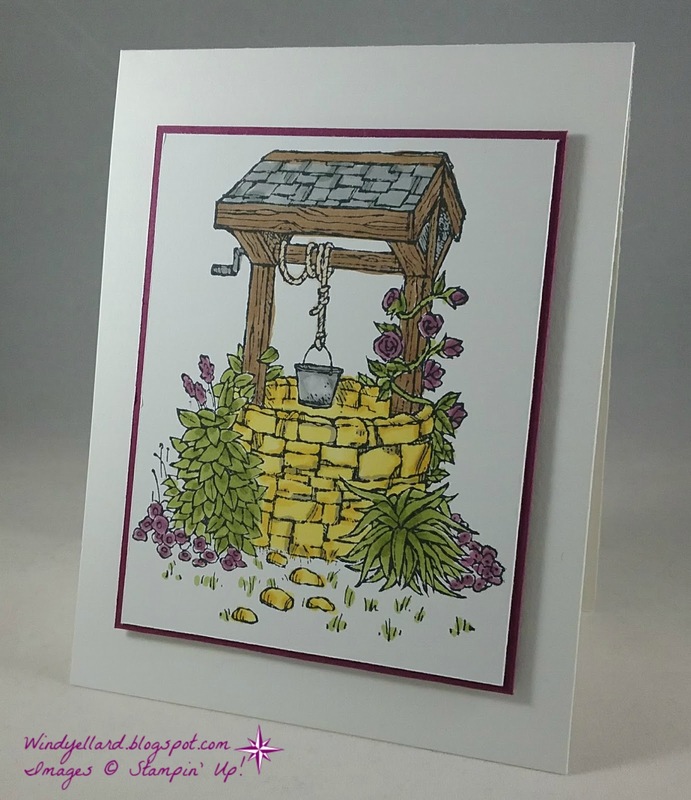 and finally cut it out and designed a card with it. I added the sentiment from the same set called Graceful Garden. I layered the image on a piece of Petal Garden DSP in Coral. thick coral twine around and made a bow to finish it off. 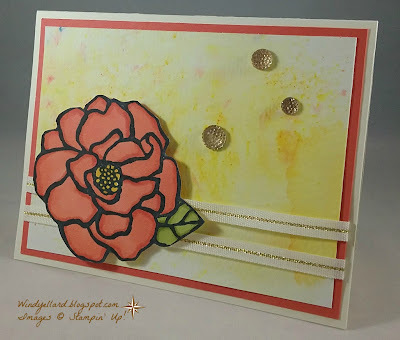 and then sat down and colored/blended with my Stampin Blends markers. a little Daffodil Delight in the center. 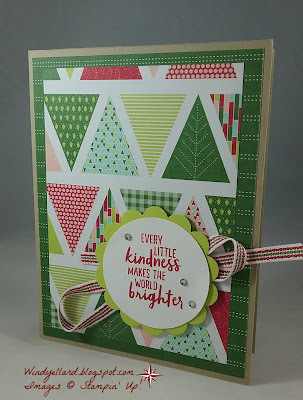 I used an oval die to cut it out. Old Olive to use since they do not look Christmas at all. pooping the oval image on the top. I like these colors together..they really pop! 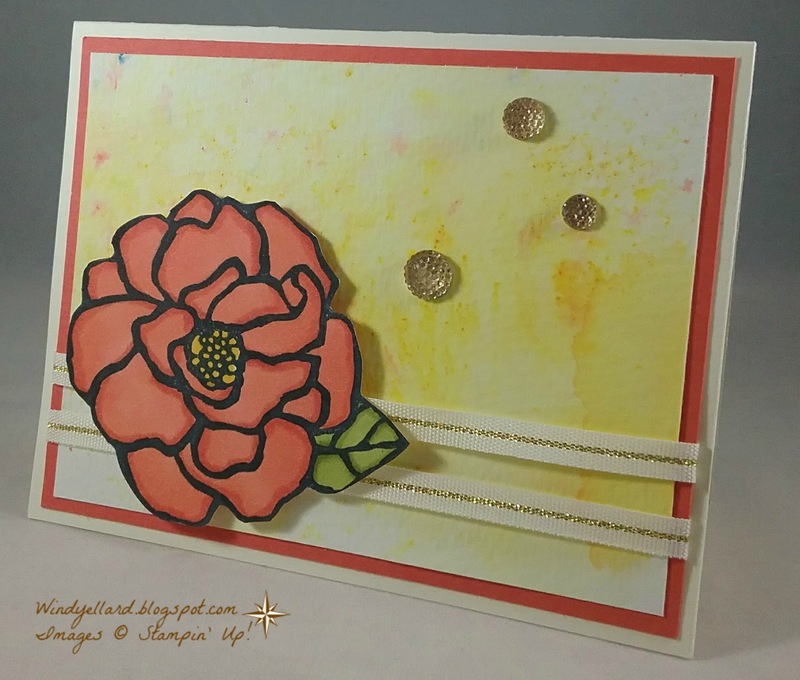 I stamped and colored this flower from the new Beautiful Day stamp set. in Memento Tuxedo Black on thick Whisper White. Ilove how the Rich Razzleberry blends. I hand snipped it since I knew it would be easy. 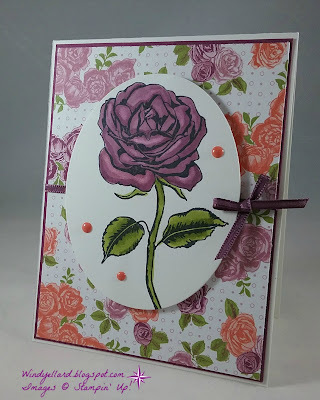 I layered it on some new paper called Petal Passion DSP. I thought the Razzleberry would pop on it and it did! I added a sentiment from the same set stamped in Razzleberry, too. I layered it all on a Razzleberry base. I finished it off with black rhinestones. available in the new Occasions catalog which begins Jan 3rd, 2018. Merry Christmas to you and hope you are having a lovely day! I am guessing the person doing the naming does not like yellow! 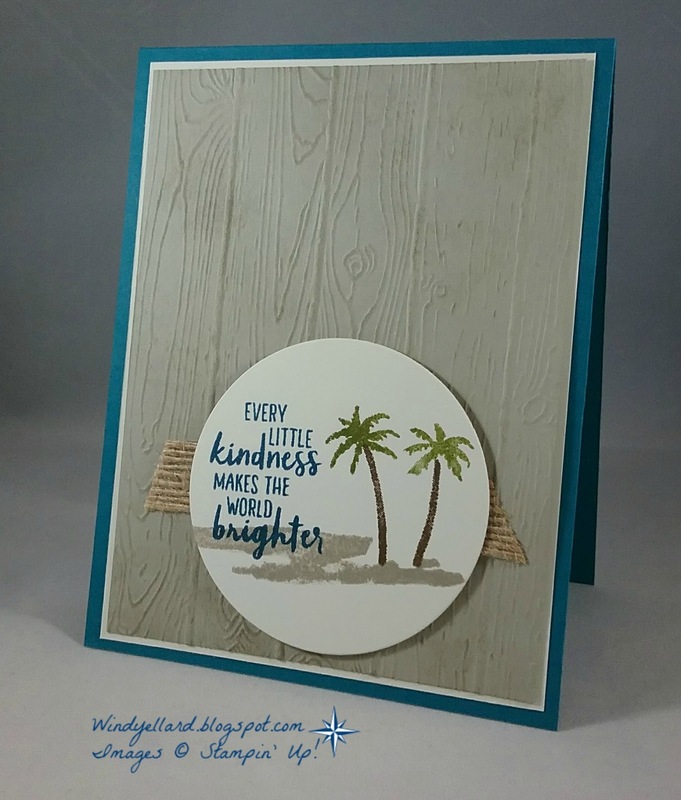 a piece of Calypso Coral card stock and a then a Very Vanilla base. I added some gold natural trim and then some gold faceted gems for bling! Stampin Blends in Coral, Old Olive and Daffodil Delight. I hand snipped it and popped it on the background! and can't wait to try other techniques with this color. Merry Christmas Eve to you! on water color paper this time. paper and then sprayed it with water. The color, like the Prussian Blue, is so bright and rich. then a piece of thick Whisper White. to color and I hand snipped. Now the antennas on the butterfly did not snip well. and layered the colored butterfly over it. from the same set to finish it off. Thanks for stopping by and have a Merry Chrsitmas Eve! and sprayed the paper with water. aqua painter over the colors. in Real Red on Whisper White. I think the blue is my favorite of the Brusho colors! Gamboge Brusho Crystal Colour background. sprayed water on to watch the color emerge. I love seeing the coral and yellow together. Burlap ribbon for more texture behind. 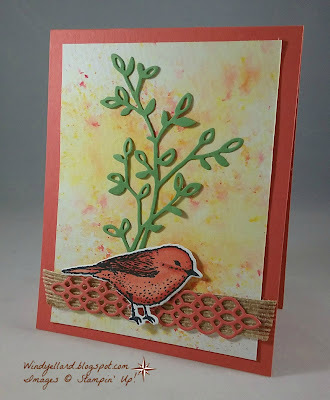 I layered it all on a base of Calypso Coral. in the new Occasions catalog on Jan 3rd, 2018.
sprinkled the powder and then sprayed it with water. The color spreads and makes an awesome background! to put on top of this great background. 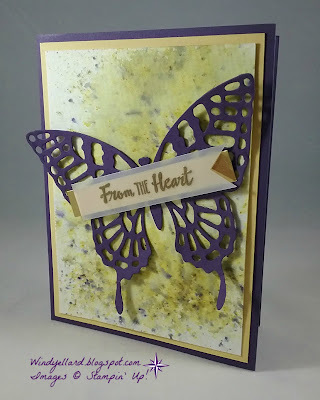 sentiment from Petal Palette on vellum. and then a Elegant Eggplant card base. 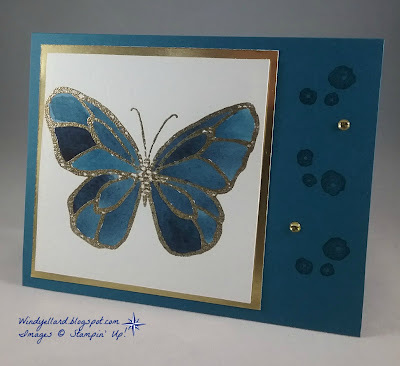 card stock and colored with my Stampin Blends markers. I was ready to design a card with them. Party after running it through the Brick Wall emboss folder. I like these colors together! I stamped these images and colored them about a month ago. Real Red ran through the Brick Wall emboss folder. I layered that onto a thick Whisper White base. I placed a piece of Crushed Curry behind the window for a lit effect. as a thank you card after Christmas. so I like to have some like this one hand. I hope you have a blessed Tuesday! Memento Tuxedo Black ink on thick Whisper White. 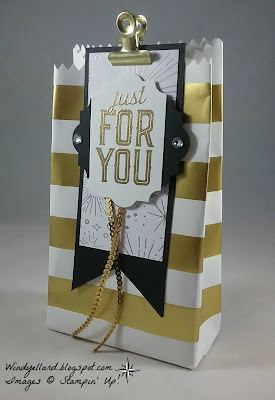 Party for the background and ran it through with the Layered Leaves emboss folder. 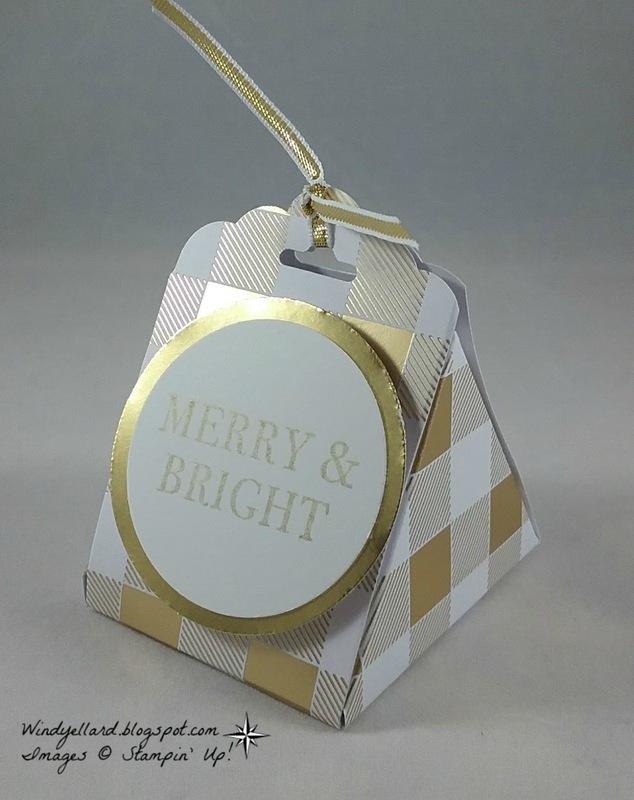 I layered it on a thick Whisper White base after I ran some Pear Pizzazz ribbon. I hope you enjoy your Monday---one week til Christmas!!!! Old Olive, Crumb Cake, Ivory. 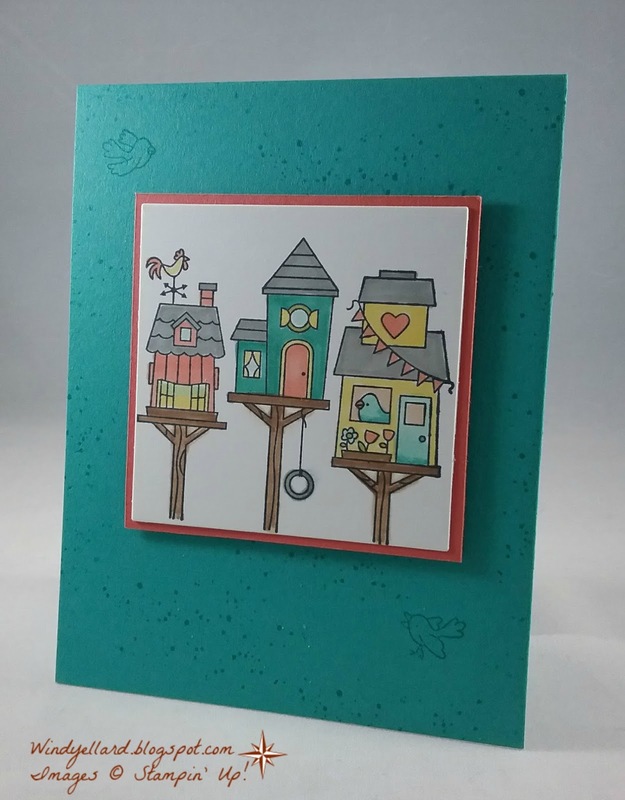 Stitched Shapes framelits dies, Pear Pizzazz 3/8"
and the new set in the Occasions catalog which starts Jan 3rd 2018.
and the little all birds on the top and bottom. and a background stamp from new Waterfront set also from the new catalog. annual catalog called Brighter Wishes. 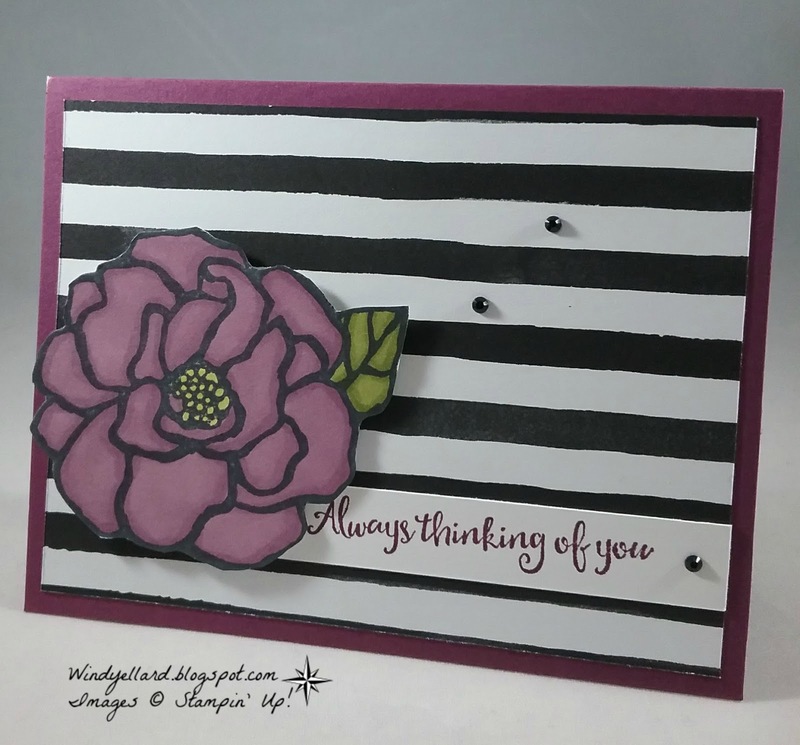 I stamped the image in Memento Tuxedo Black on thick Whisper White. Hope you have a wonderful weekend and thank you for stopping by! 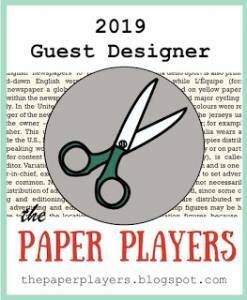 which starts Jan 3rd 2018. It has pine trees and palm trees in the set. like this one which i will probably a bunch. I cut it out with a Layered Circle framelits dies. and then a Island Indigo base. For more texture, I place a piece of burlap ribbon behind the scene. I love this set and hope you enjoy the scene today! I was mailing out this week. and added some Quilted Christmas DSP on top. 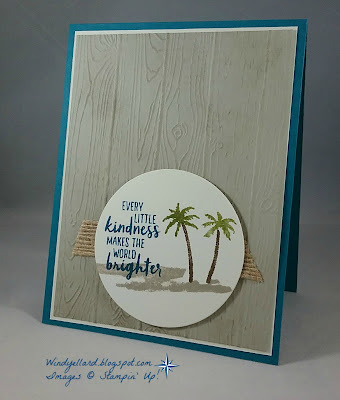 I stamped a sentiment from a new set called Waterfront. Love the sentiment and will probably use it a lot. I used a retired 2 3/8" scallop circle punch with Lemon Lime Twist. I put some fun ribbon behind plus some bling on the white circle to finish it off. Stampin' Blends in Pool Party and Old Olive. I had already laying on my desk. I stamped the sentiment from the same set in black. I used the new Petal Passion DSP for the background. I love the black and white but it can be colored, too! and then the Basic Black base. 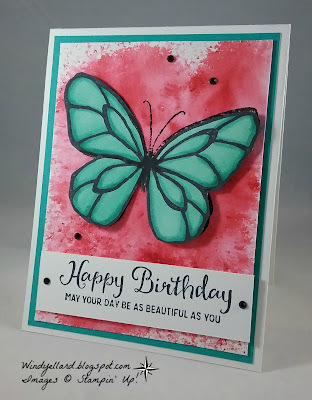 This card was done in just a few minutes! I will be playing lots with this bundle! 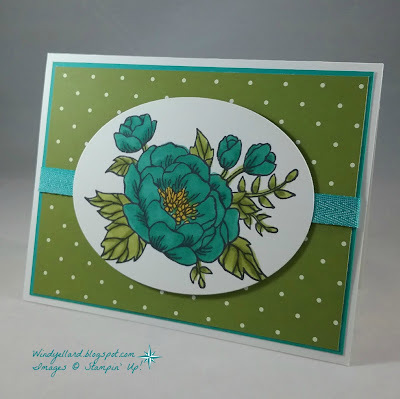 I got my pre order for the new Occasions catalog this weekend. and my husband's 50th birthday happening. Can't wait to do more playing with new stuff! 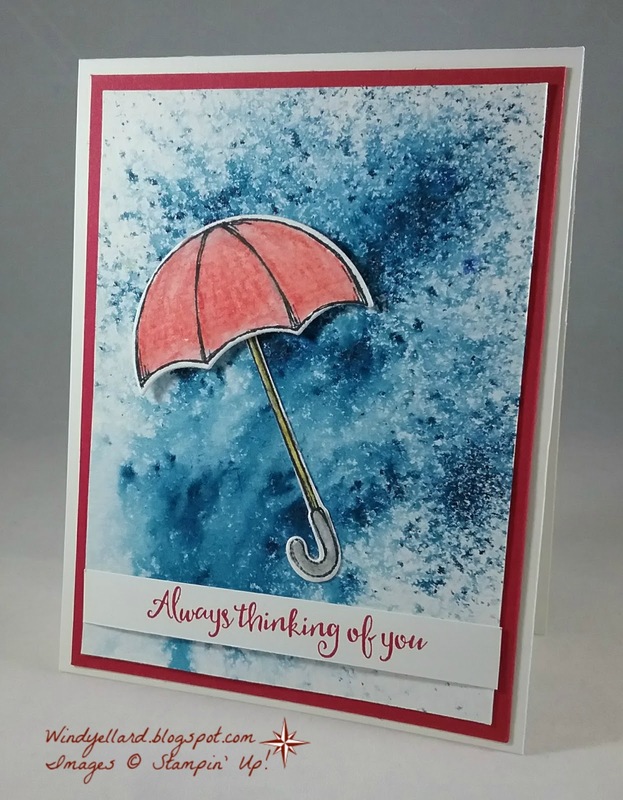 and grabbed the colors from one card for this one. the new SAB set called Amazing You. Whisper White circle in Daffodil Delight. 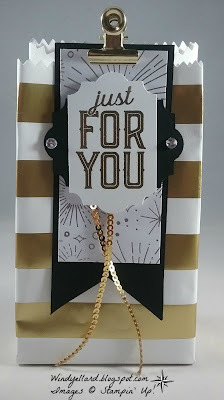 I layered a thinlit die from Celebrate You in Bermuda Bay on top. I stamped in Bermuda Bay words and cut them out. I finished it with some rhinestones! is what I put inside of them- Lindt's Lindor white and milk chocolate truffles. 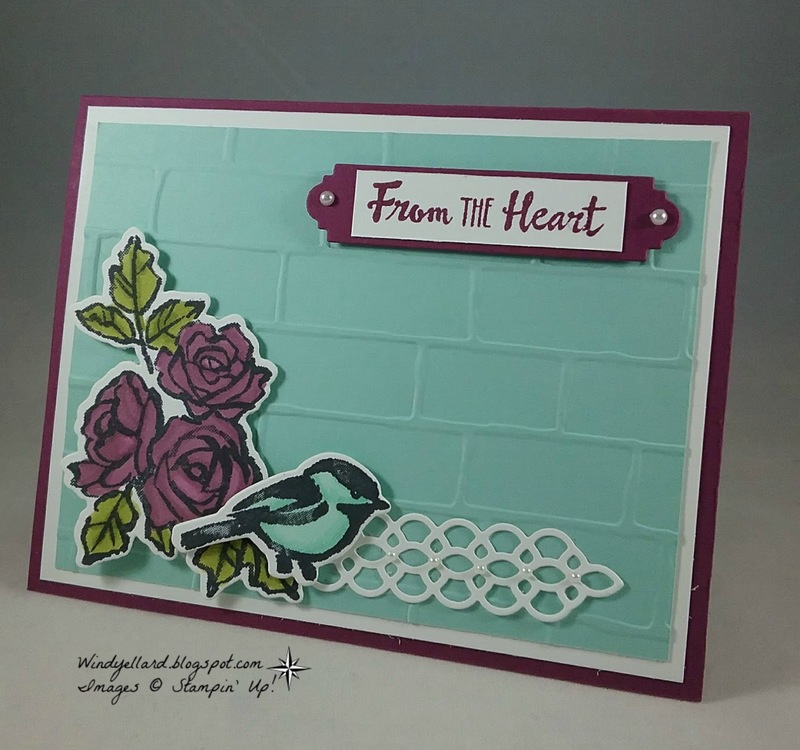 Hearts Come Home stamp set. 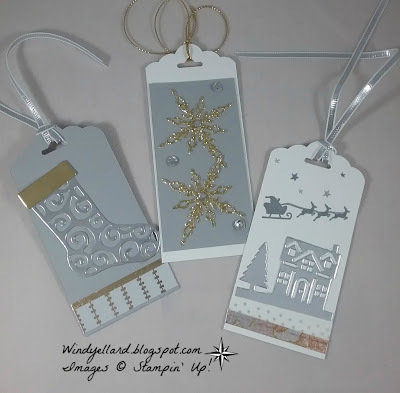 Some gold 1/8" ribbon and silver tinsel trim finish these off. Better side photo. Perfect for a single candy like I did! I made these bags for my tags class last week to carry their creations home. I turned them into a gusseted bag. Cut 1/8" off the bottom of the bag. 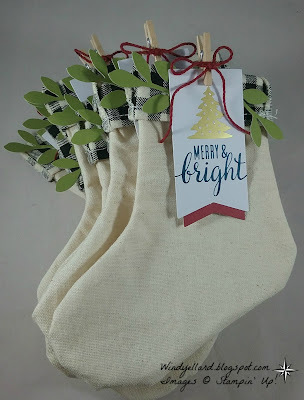 Score the bottom at 1" and then 3/4" on each side of bag. Cut up from the bottom at each score line to the 1" score line. Apply adhesive to your flaps and close the bottom. snipped a banner at the bottom. and added some bling with rhinestones. and then punched with the same matching punch. Last day of tags! Finishing up with some more bling! are from the Swirly Snowflakes thinlits dies. More houses from the Hometown Greetings edgelits dies. 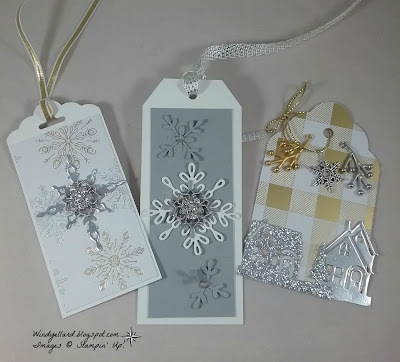 More bling snowflakes from Seasonal Layers thinlits dies. 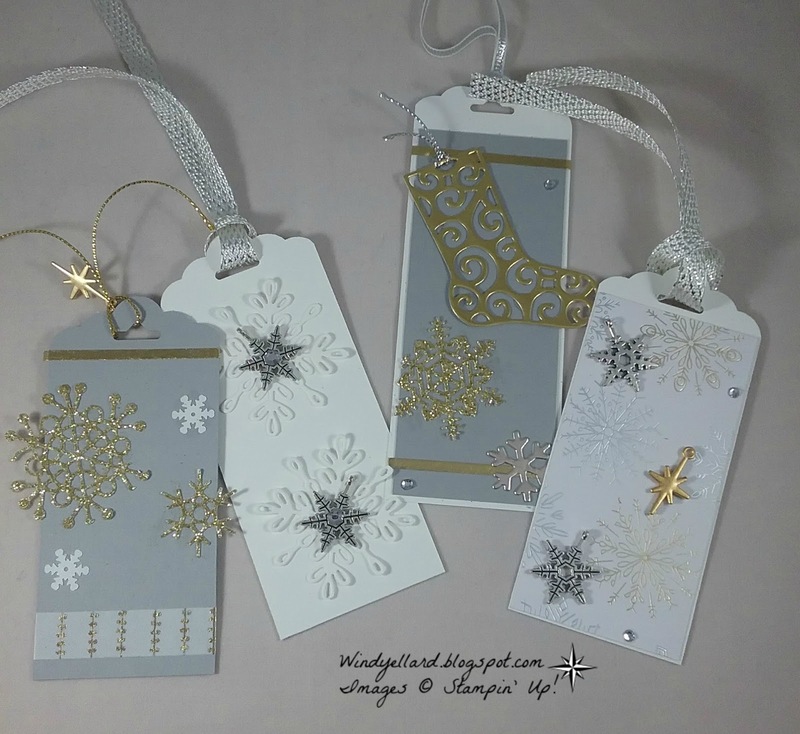 Snowflakes on second tag are from Swirly Snowflakes thinlits dies. 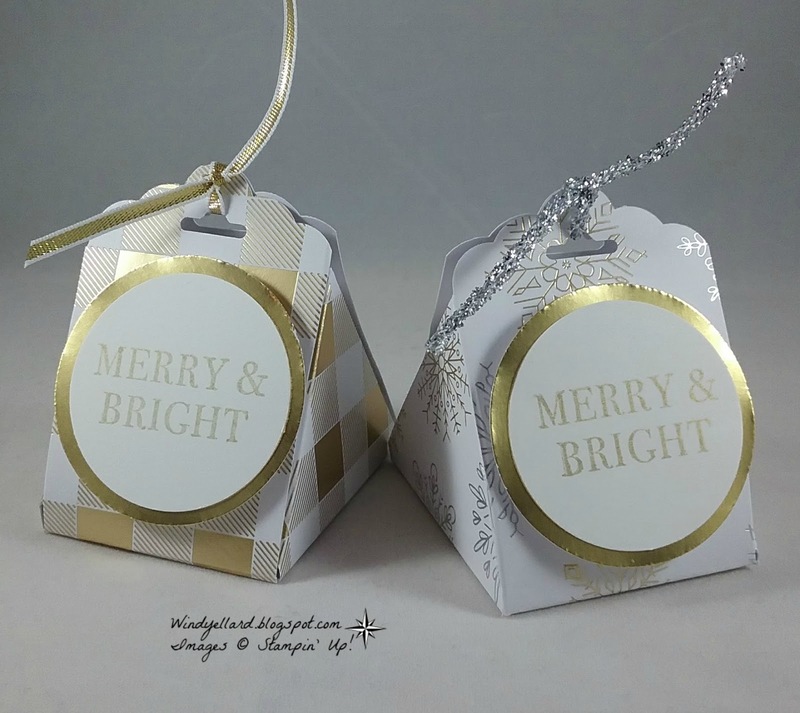 Using the Christmas Stocking die in gold foil. Great use for your washi tape on tags! 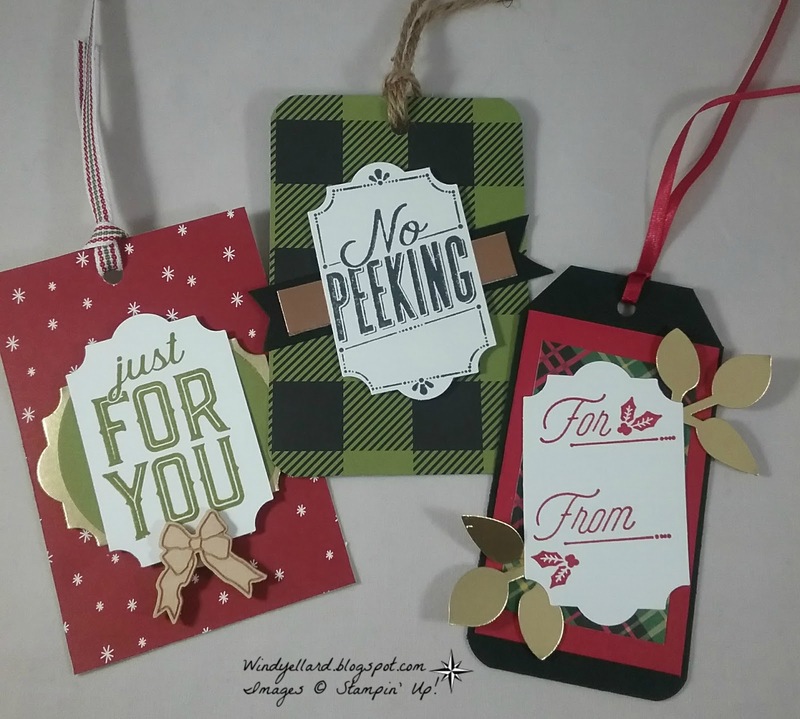 Hope you have been inspired with the tags! Enjoy your weekend! Year of Cheer DSP in gold! 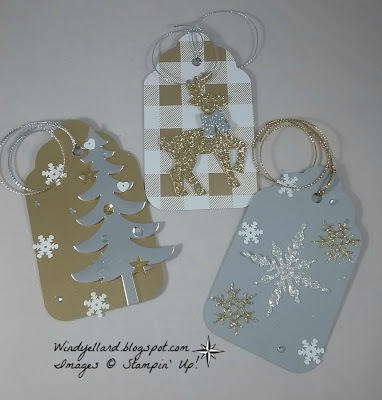 makes for a very bling tag! The house edgelits dies are perfect (from Hometown Greetings edgelits). 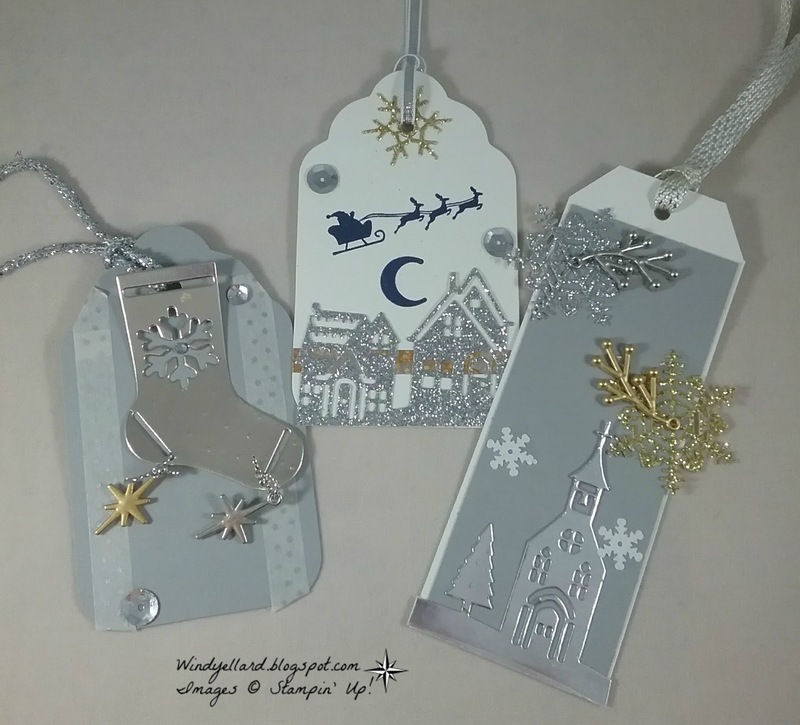 You can cut in half and have two pieces for two tags! 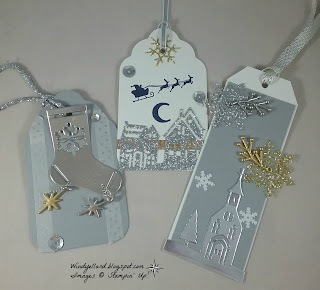 Matching stamps have the cute Santa with sleigh stamp. are great on a Smoky Slate background. a gold foil topper! It is finished off with some Tear of Cheer washi tape. the Card Front Builder thinlits dies. Awesome gold glimmer tree from Santa's Sleight thinlits dies. And the houses and church are from the Hometown Greetings edgelits dies. 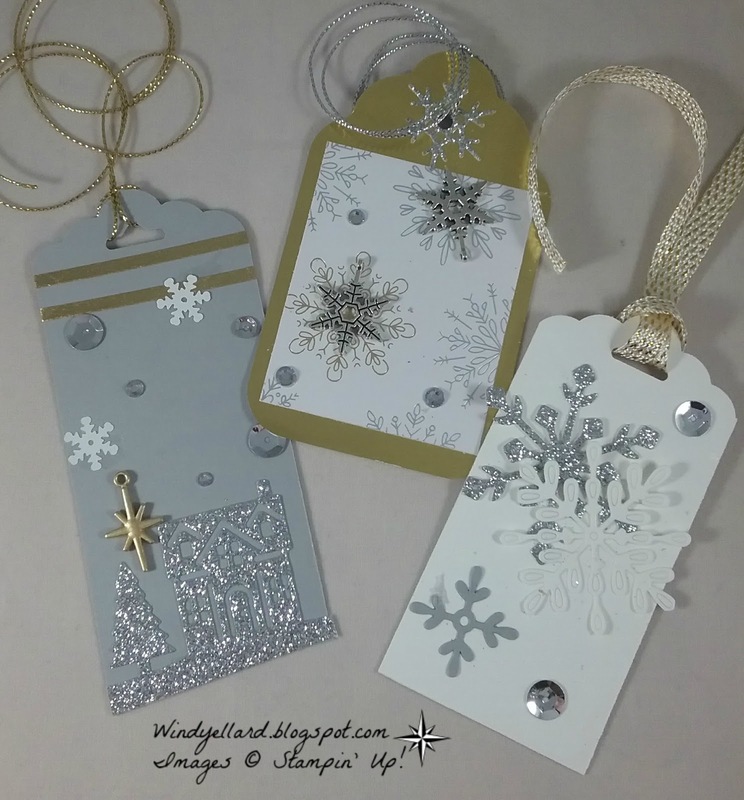 These snowflakes are from the Seasonal Layers dies. 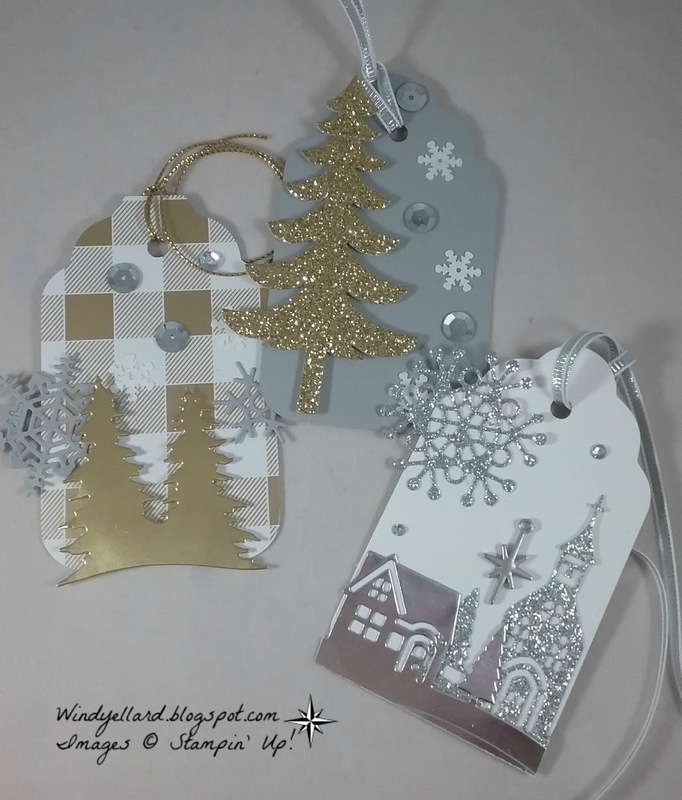 I used an old sizzix die for the left and right tags. Love the reindeer from Santa's Sleigh framelits dies in glimmer gold! 1/8' silver ribbon in the middle. so we made all our tags in those colors. and the Stocking thinlits dies with the Hearts Come Home set. We love snowflakes and embellishments, too! 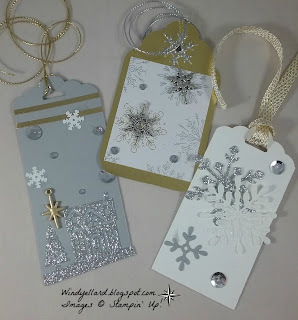 Love the glimmer paper and more snowflakes the better, too! 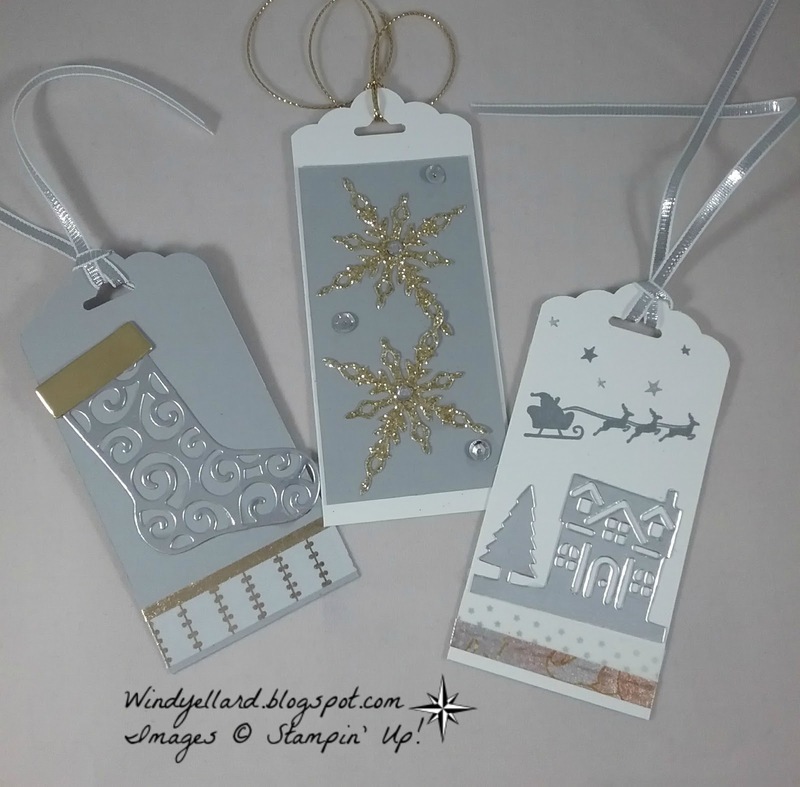 I have used an old sizzix die plus the tag topper punch. 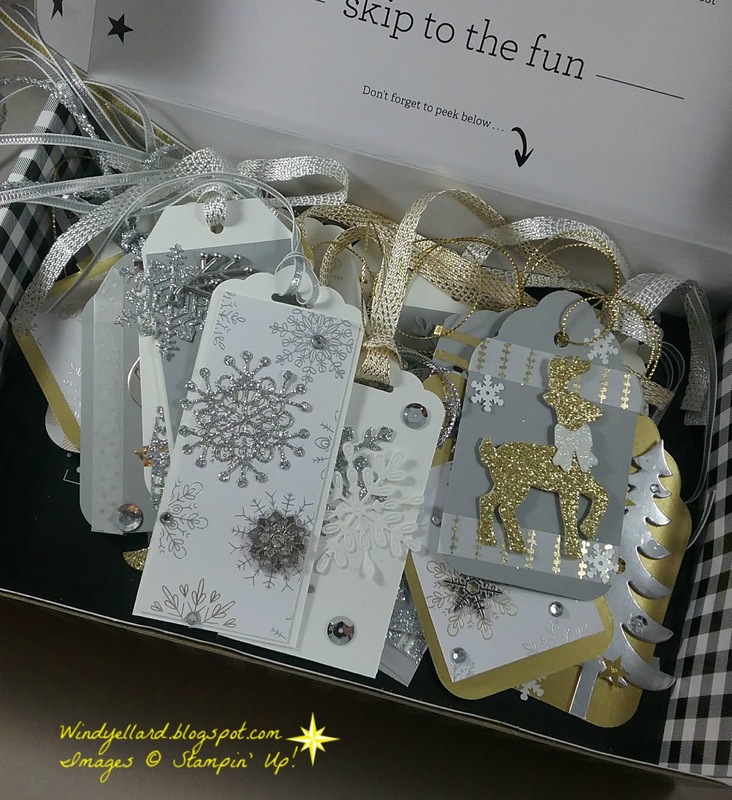 Welcome back to Christmas tags week-Day Three today! it with some projects I had designed for the InkBig design team. I used a piece of thick Whisper White and the Scalloped Tag topper punch. Layered some Old Olive and Cherry Cobbler card stock. 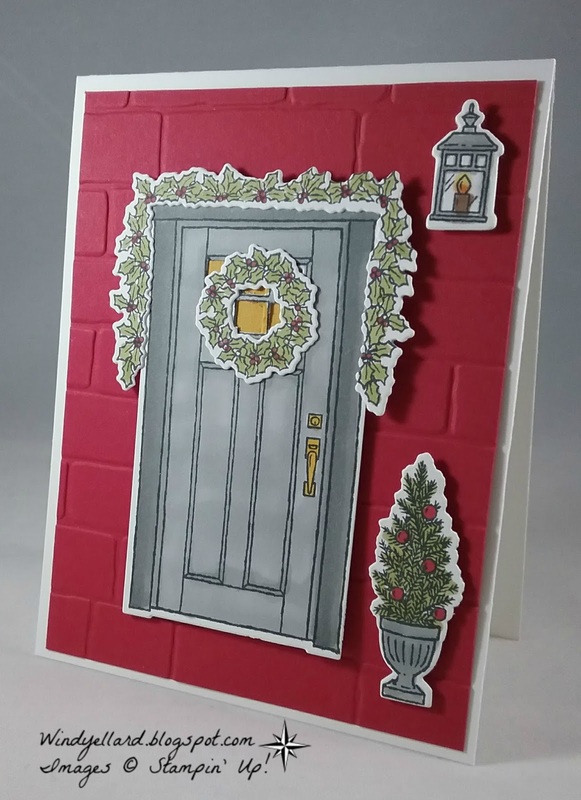 I stamped the sentiment from Ready For Christmas in Memento Tuxedo Black. I also stamped the gifts from the same set and colored with markers. 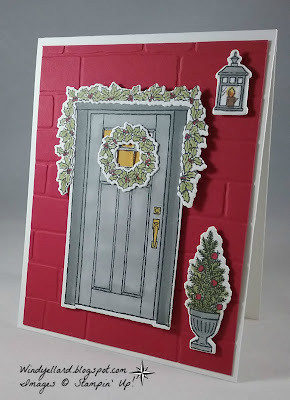 I cut them with the matching dies called Christmas Staircase thinlits dies. Some rhinestones and Mini Tinsel in Real Red and silver ribbon to finish it off. 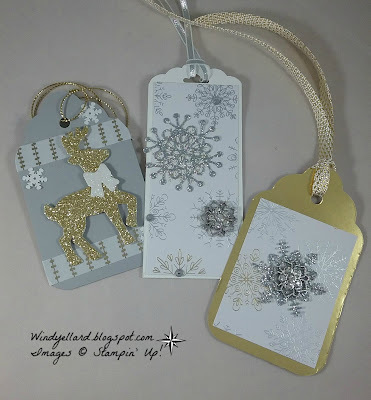 Second tag used the same white base and scallop topper punch. it up the for the focus of this tag! It is finished off with Real Red ribbon. The third tag used the same DSP in a different plaid. 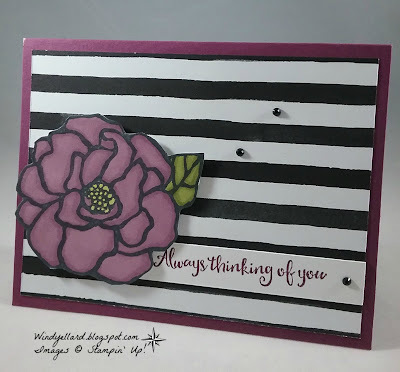 I layered it on the Basic Black base using the same topper punch. called Tin of Tags. I love the sentiments in that set so I am keeping it around. More Real Red ribbon the finish it off. See you tomorrow for more tags! Welcome back to Christmas tags week day 2.
the set and punch for my tags today. behind the Cherry Cobbler punch and the Garden Green sentiment punched out. 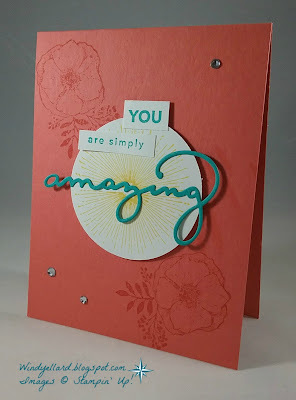 I stamped the sentiment in Cherry Cobbler and finished it off with a little bling! Second tag is on Basic Black card stock with the edges corner rounded. 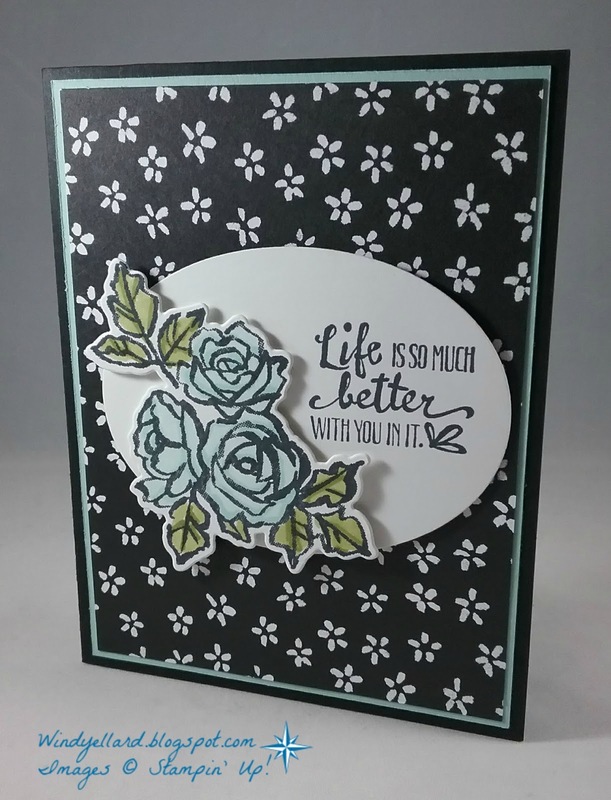 before adding the sentiment stamped on Whisper White in Memento Tuxedo Black. I also used some Old Olive 3/8" mini chevron ribbon for the tie. punched out with the Everyday punch and a piece of Cooper foil banner peeking behind. The sentiment is stamped on Whisper White in Garden Green. Stop back tomorrow for more tags since it is Christmas tags week here! Thanks for stopping by today and have a blessed Monday! 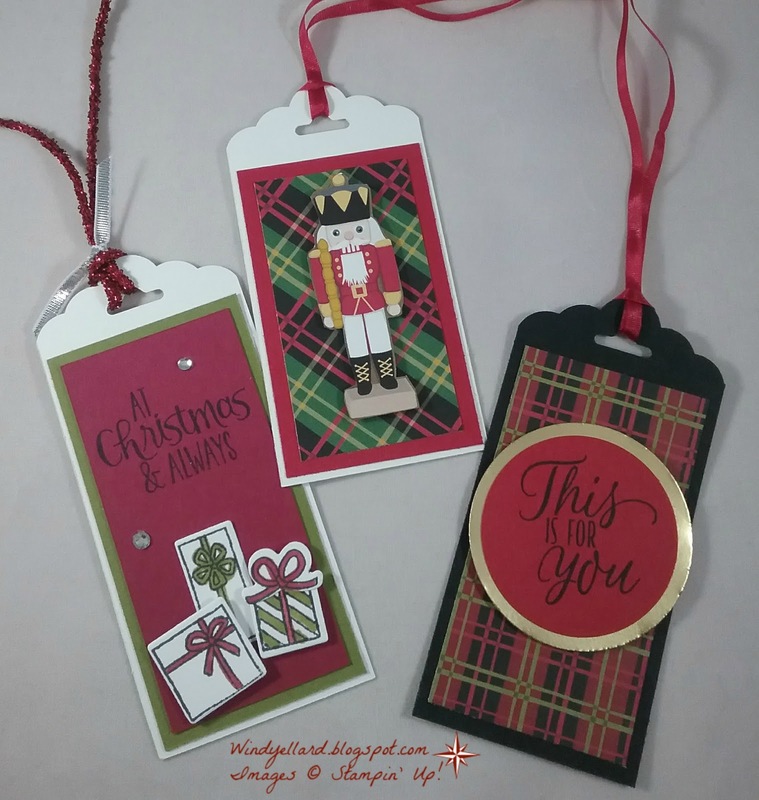 Welcome to a week of Christmas tags! This is day 1 of my days o' tags. I have a Christmas tag class this week. and make as many tags as they want. Crazy but loads of fun! I used the Merry Little Labels bundle which has a set and matching punch. So easy to use especially use the punch for behind details, too. a Christmas Around the World embellishment. 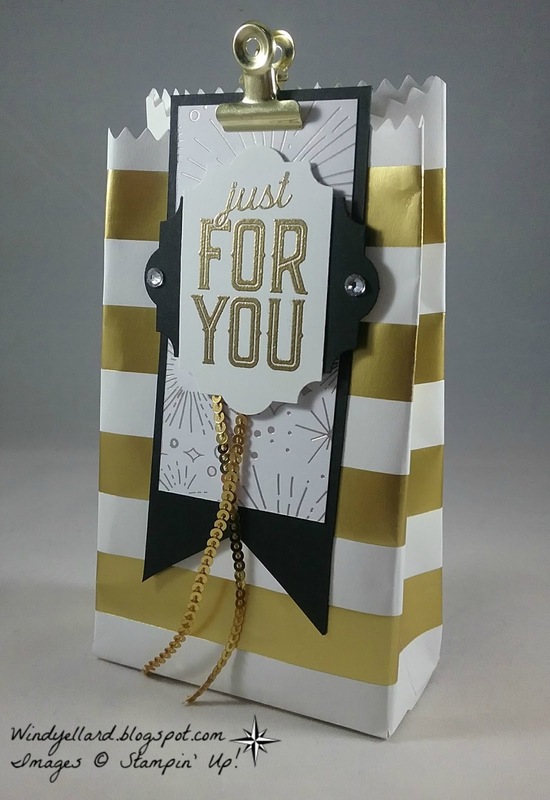 with a black banner and strip of Copper foil behind the sentiment. Some jute ribbon to finish it off. the leaf punch and some 1/8" Real Red ribbon to finish it off. Come back all week for more tags! Thanks for stopping by today and have a lovely Sunday! 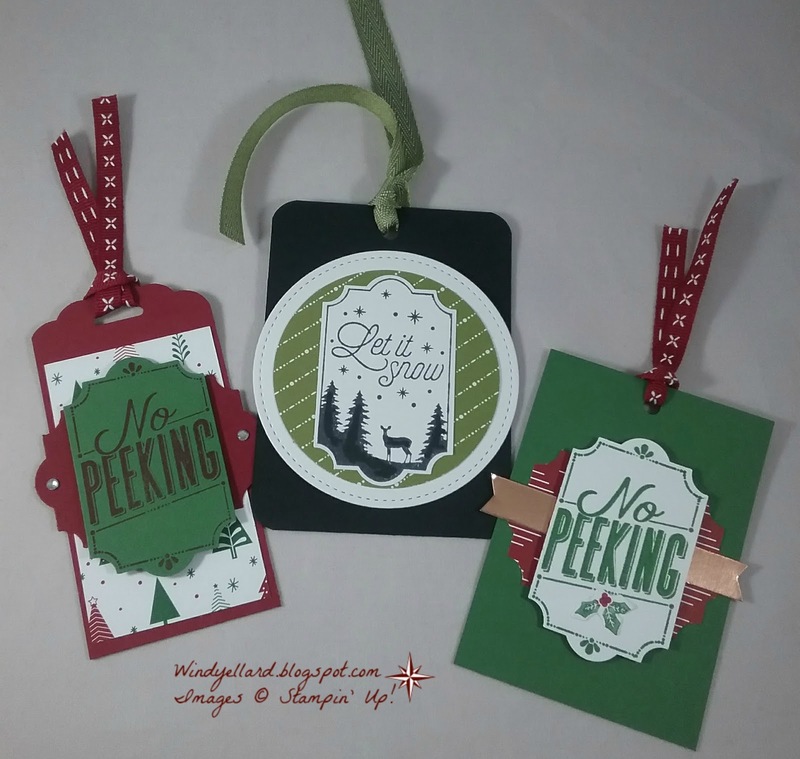 These were the November Paper Pumpkin kit. I put 9 of them together and decorated them all the same. I plan to give these to a the hostess at my Bible study on Wed the 13th. I am going to place inside a Panera Bread gift card and a note for each. Some candy will probably find its way in, too! gold tree so I just stamped in Dapper Denim the sentiment. 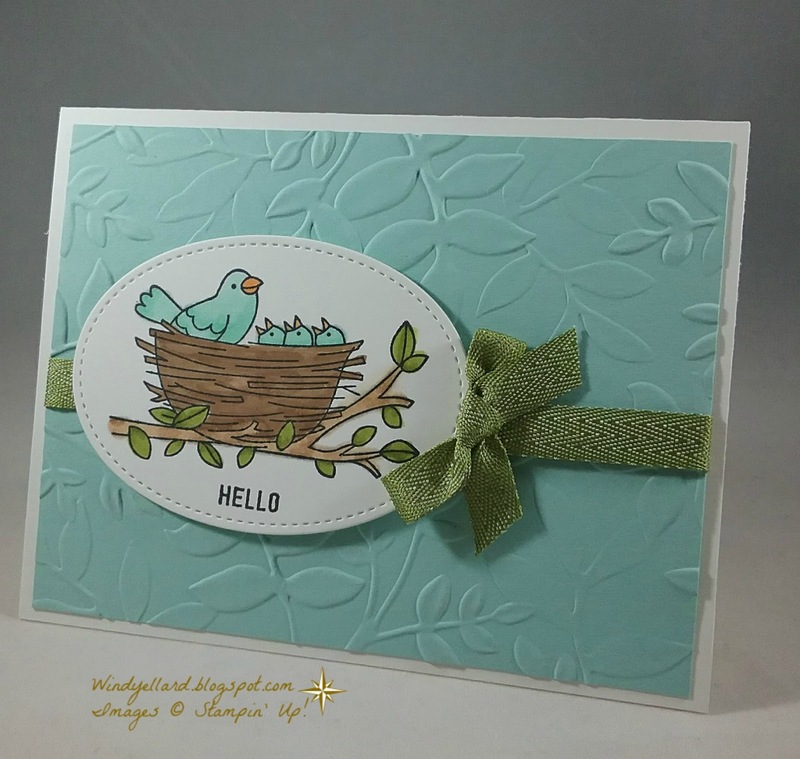 I added the leaves and twine with the clothespin which were included in the kit. Hope you have a lovely weekend and thanks for stopping by!